Babylonia was a city state in Mesopotamia in the 2nd millennium B.C., over 3000 years ago. Its capital city was Babylon. Babylonia was a city state in Mesopotamia in the 2nd millennium B.C., over 3000 years ago. Its capital city was Babylon, which was derived from the word bav-il or bav-ilim meaning “The Gate of the Gods”. The famous city served for nearly two millennia as a center of Mesopotamian civilization whose ruins lie in modern-day Iraq 59 miles (94 kilometres) southwest of Baghdad. 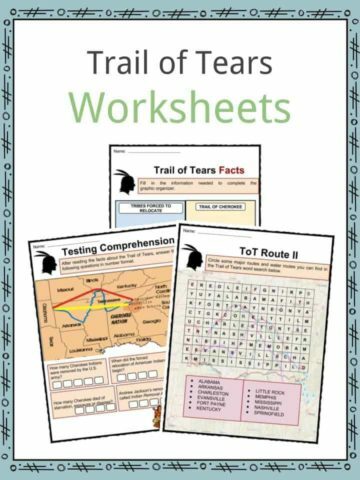 See the fact file below for more information on the Babylonia or alternatively, you can download our 27-page Babylonia worksheet pack to utilise within the classroom or home environment. Mesopotamian civilization was one of the earliest in world history. It is the region of the two rivers, Euphrates and Tigris. Two civilizations flourished in the region that would later be known as Babylonia: Sumer in the south and Akkad in the north. The known history of Babylon then begins with its most famous king, Hammurabi (1792-1750 BCE). It was initially a small provincial town, but it greatly expanded during the reign of King Hammurabi to become a major capital city. The Amorite prince transformed the city into one of the most powerful and influential in all of Mesopotamia. King Hammurabi established the earliest set of laws called Hammurabi’s Code, recorded on clay tablets and tall pillars of stone called steles. He established a bureaucracy with taxation and centralized government. The most famous rule he set is now known as an eye for an eye. 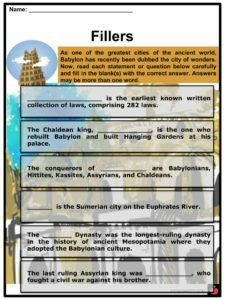 The First Dynasty of Babylon or the Old Babylonian Empire reached its greatest height, in terms of territory and power, under the rule of Hammurabi. He had united all of Mesopotamia, and named his realm Babylonia. 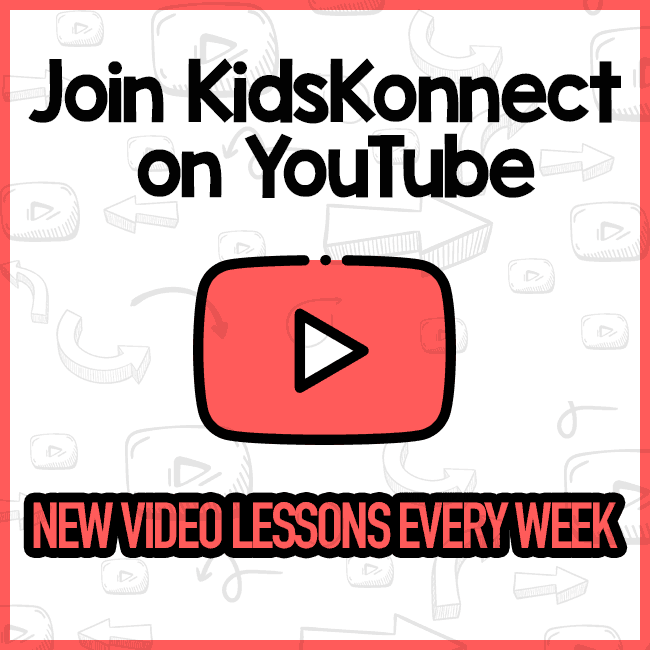 After Hammurabi died, his empire fell apart and, in 1595, the Kassites conquered Babylon and ruled for over 400 years. Babylon was renamed Kardunias during their reign. The Kassite Dynasty was the longest-ruling dynasty in the history of ancient Mesopotamia, where they adopted the Babylonian culture. During the last few centuries of Kassite rule, they were under constant threat from the Mesopotamian kingdoms of Assyria and Elam. Most of Babylonia was ultimately conquered by the Elam civilization in 1158 B.C., bringing an end to the Kassite Dynasty. The Elamites remained in control of Babylonia for a short duration and were soon displaced by King Nebuchadnezzar I. They were then conquered by the Neo-Assyrians. Internal civil wars in Assyria caused its downfall. The last ruling Assyrian king was Ashurbanipal, who fought a civil war against his brother, the sub-king in Babylon, devastating the city and its population. Babylonia took advantage of this and rebelled under Nabopolassar. King Nabopolassar took the throne in 626 B.C. It was his son Nebuchadnezzar II who rebuilt Babylon and returned it to its former glory and expanded their empire from the Persian Gulf to the borders of Egypt. 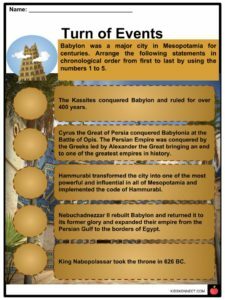 This second Babylonian Empire was called the neo-Babylonian Empire and it is considered the greatest period of Babylonian supremacy. It was under Nebuchadnezzar II’s reign that the Hanging Gardens of Babylon are said to have been constructed and the famous Ishtar Gate built. 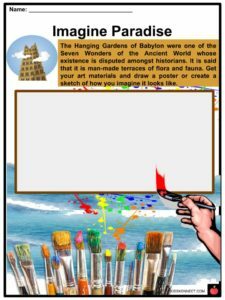 The Hanging Gardens of Babylon were considered as one of the Seven Wonders of the Ancient World. However, some historians doubt its existence as there is no physical evidence. The king ordered the deportation of many Jewish inhabitants to Babylonia. The Euphrates River divided the city in two between an `old’ and a `new’ city with the Temple of Marduk and the great towering Ziggurat in the center. After Nebuchadnezzar II died, the empire began to fall apart once again. In 539 B.C., the Babylonian empire, under the rule of Nabonidus, was finally brought to an end by Cyrus the Great of Persia at the Battle of Opis and made it part of the Persian Empire. One of the first acts of Cyrus was to allow these exiles to return to their own homes. The Persian Empire was conquered by the Greeks, led by Alexander the Great, bringing an end to one of the greatest empires in history. The Babylonians were religious people who worshiped numerous Gods and built many great temples. Marduk was the head of the deities of the Babylonian pantheon. He was considered the supreme deity over all the other gods. He had as many as 50 different titles. He was sometimes pictured with his pet dragon. Babylonian deities include Ea, the god of wisdom and spells; Sin, the moon god; Shamash, the sun god and the god of justice; Ishtar, the goddess of love and war; and Adad, the god of wind, storm and flood. Tiamat, is the Goddess of the Sea who was defeated by Marduk in a battle. 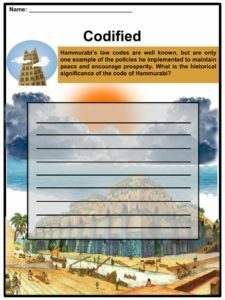 Babylonians spoke the Akkadian language and used Cuneiform for writing. 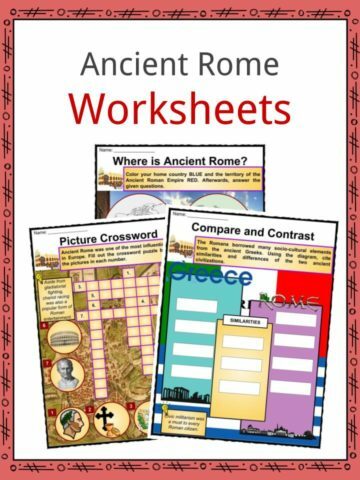 They used more than 350 signs or symbols in their writing. The Babylonians wrote around 2000 books. They composed books on religion, science, mathematics, and astrology. One of the most famous Babylonian literatures is “Gilgamesh”. 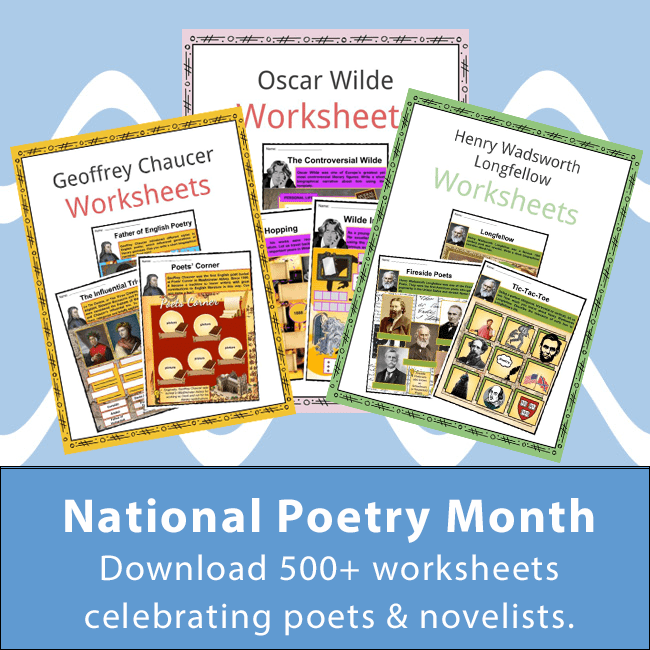 This epic describes king Gilgamesh, the legendary hero of Babylon. The Babylonians ate vegetables, fruits, meat, and fish. Barley was their staple crop that they would make flat breads with. Babylonians wore skirts and shawls very similar to the Sumerians. Wealthy people decorated them with tassels, sashes, and embroidery. Higher-ranking people wore longer garments and scarves that indicated their rank by the length of its tassels. The Babylonians loved art. Constructions like Ishtar Gate and Etemenanki ziggurat were built, making Babylon the most beautiful city in the ancient world. Ishtar Gate was one of the eight gates of the Babylon city, dedicated to the goddess Ishtar. 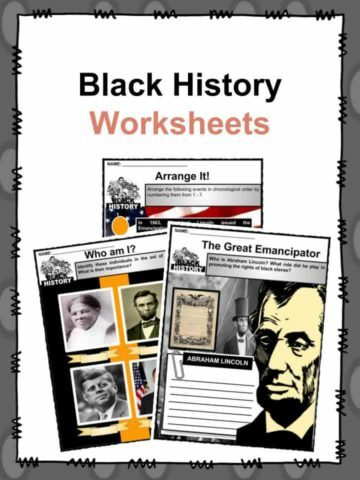 They invented metalworking, copper-working, glassmaking, lamp making, textile weaving, flood control, water storage, as well as irrigation. 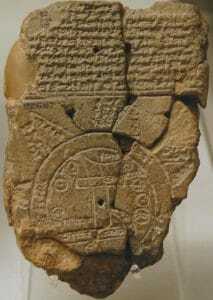 Babylonian numerals were written in cuneiform. They invented the first positional numeral system where the value of a digit depends on both the digit and its position. And from their number system, we acquired our concept of 60 minutes in an hour and 60 seconds in a minute. 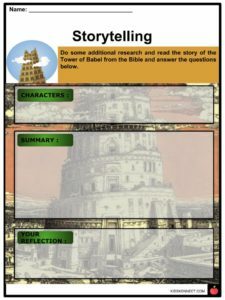 Babel or Babylon, in the Book of Genesis, chapter 11, describes a united human race, speaking one language trying to build a city and tower to the heavens called the Tower of Babel. God stops the construction of the tower by causing the people to begin speaking in different languages so they would not be able to complete their great tower. Babylon appears throughout in the biblical books, most notably in the Book of Revelation. This is a fantastic bundle which includes everything you need to know about Babylonia across 27 in-depth pages. 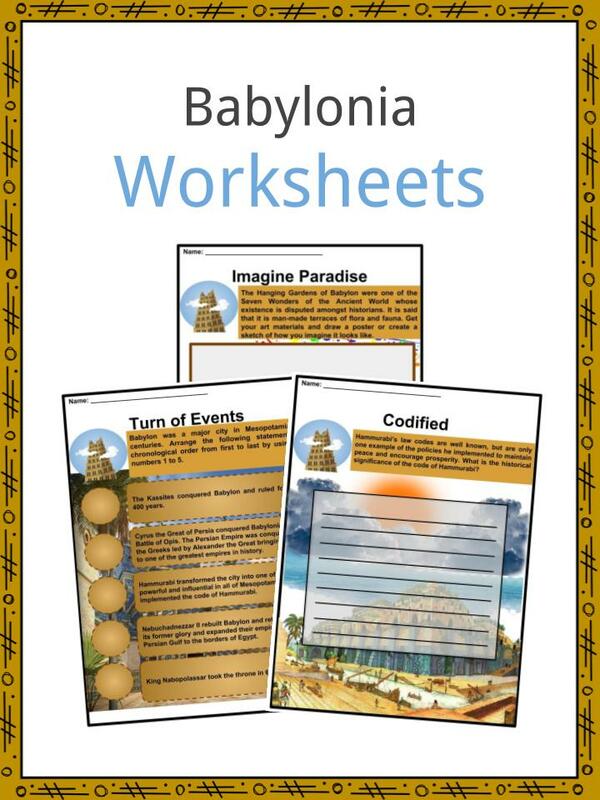 These are ready-to-use Babylonia worksheets that are perfect for teaching students about the Babylonia which was a city state in Mesopotamia in the 2nd millennium B.C., over 3000 years ago. 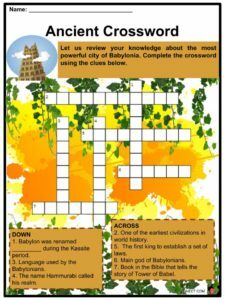 Its capital city was Babylon, which was derived from the word bav-il or bav-ilim meaning “The Gate of the Gods”. The famous city served for nearly two millennia as a center of Mesopotamian civilization whose ruins lie in modern-day Iraq 59 miles (94 kilometres) southwest of Baghdad.